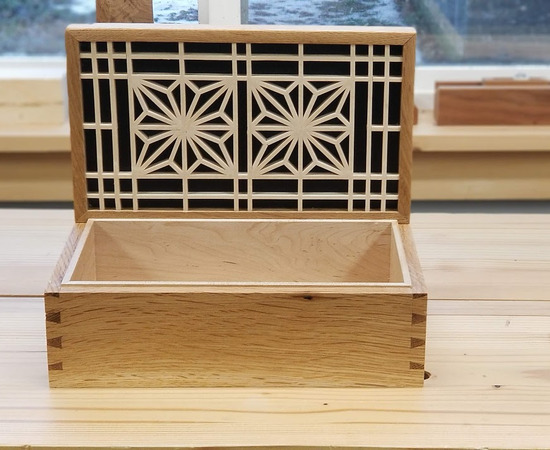 Finished product first - this is a small tea box made from white oak and features a kumiko panel in the lid Kumiko is a Japanese art form which involves creating intricate lattice work without the use of mechanical fasteners. It's most often found in sliding doors (shoji). This pattern is called Asa No Ha and is one of the most popular and traditional patterns. Here is a piece of white oak I got for 4 bucks. 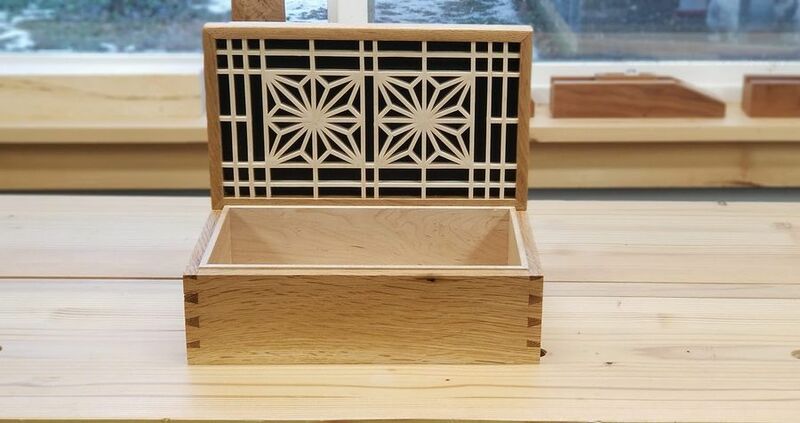 It's an offcut from a professional cabinet shop. 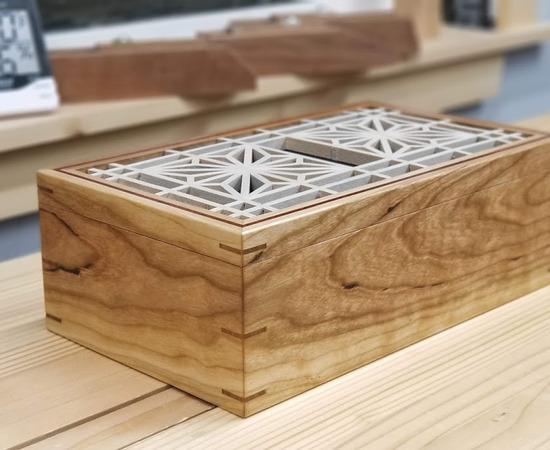 I have a rough idea on the size I want the box to be, but I used the golden ratio (1.61) to get to my final dimensions of 11 1/2" x 6 3/4". The golden ratio isn't necessary when figuring out proportions, but if you use it as a guide, your proportions won't look bad. I've got a little over 1 3/8" of thickness which will allow me to slice this in half (resaw) and get two 1/2" thick boards. 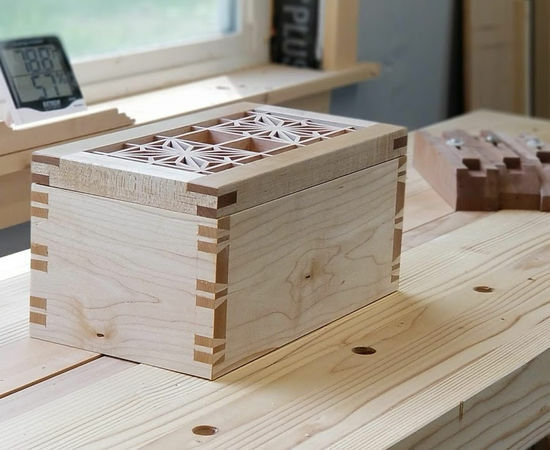 Personally I'm not a fan of chunky boxes so I try to keep mine between 1/2" and 5/8" thick depending on the size of the box and its intended purpose. Once that is done I notice the board has some checking. I make a mark and measure from that mark. I'll saw the checked part off. 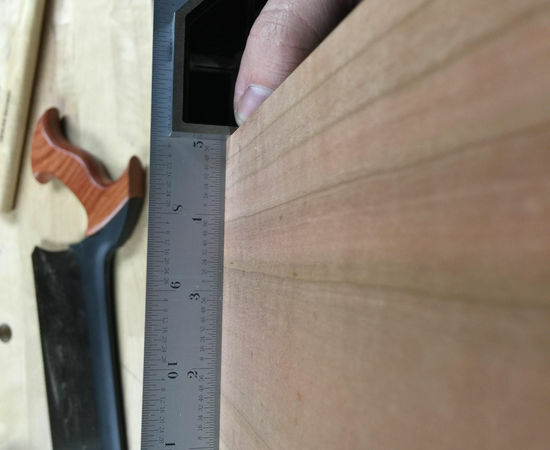 I then measure out the rough length of 1 long side (11 1/2") and one short side (6 3/4)" plus another inch or so for insurance. Then I scribe the cut lines with a marking knife, take it to my low saw horses, and crosscut the board. The shorter the board is (to an extent) the easier it is to work with. Now I need to true up one of the edges. I do this with my jointer plane. I have the board on the bench in a birds mouth - which is just a piece of plywood with a V cut out so I can wedge the piece in. 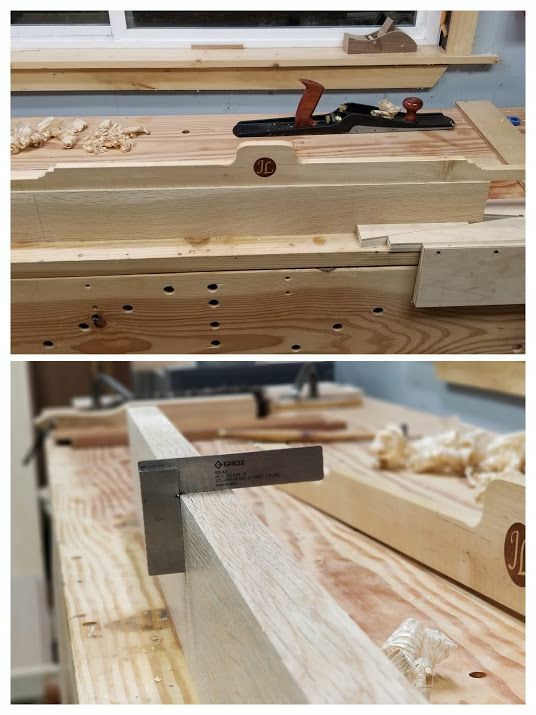 I prefer to joint edges this way over using a vise. The board is fully supported on the bottom so I won't introduce any bow. 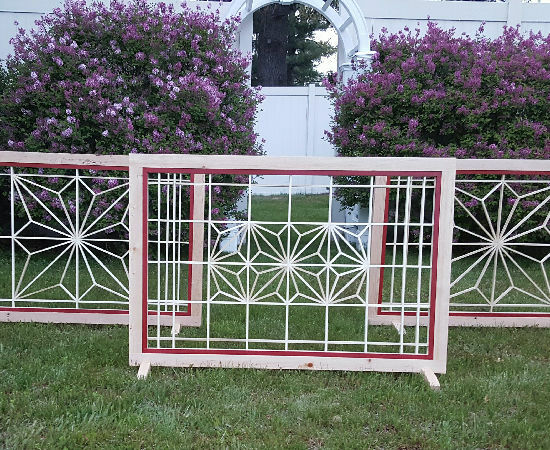 Now I need to bring the other edge parallel, and get the piece to exactly 4". I do this on the tablesaw with the freshly jointed face up against the fence. On to resawing. 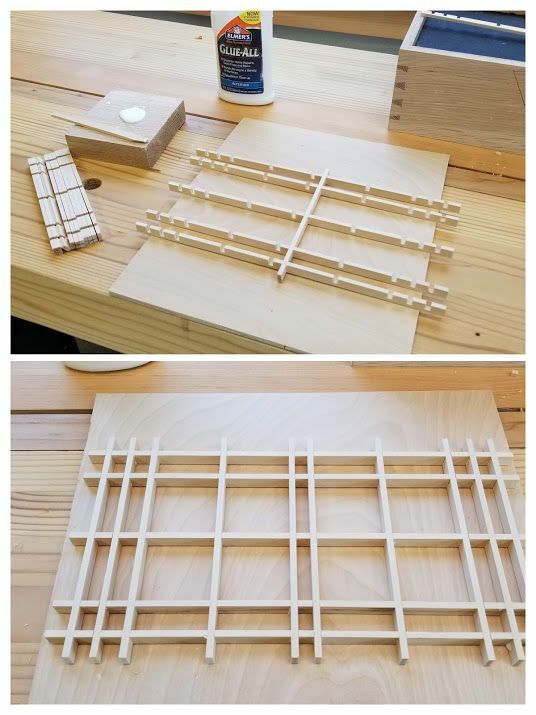 I find the center of the board and go around all 4 sides with a marking gauge. I take several passes here to make a deep scribe. This will lessen the tenancy of the bandsaw to wander a bit and give me a good reference. I prefer to use a tablesaw sled. It's much more accurate and repeatable. I cut one end square, slide that square end up to the stop, and repeat. Now it's time to lay out the dovetails. I'm using a square, pencil, ruler, dovetail marker (14 degrees) and a small pair of dividers. Now with a miter square, I draw a miter on all 4 corners of each piece. 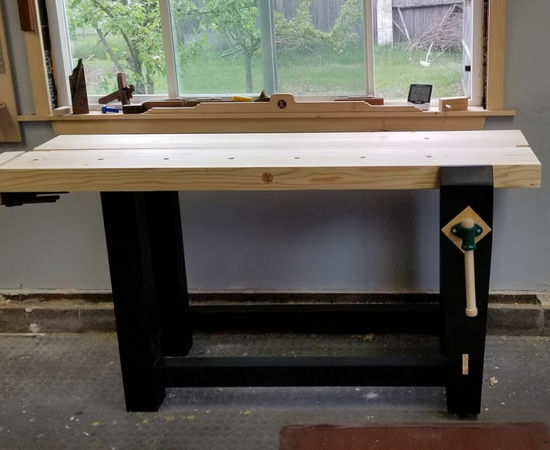 i'm using this benchtop vise to raise the work up to a more comfortable level for sawing while still being low and fully supported in the vise. Now I remove the waste with a coping saw, staying away from my baseline. 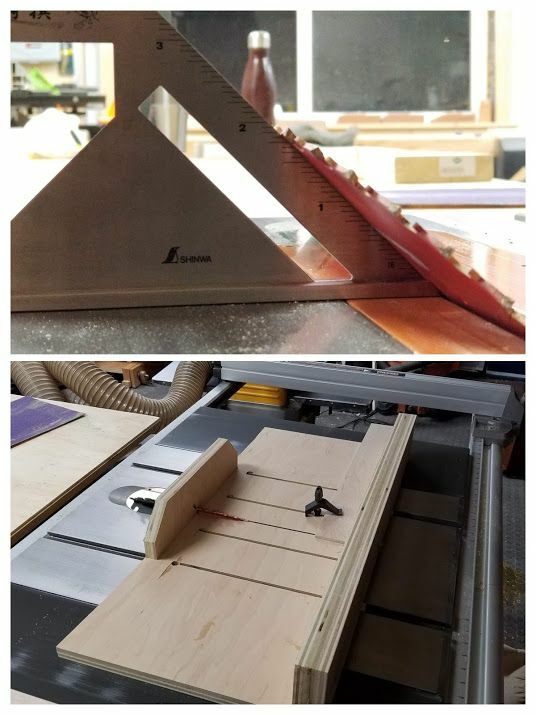 Pro tip: Coping saws get a bad reputation. This Eclipse saw isn't high end, but it's nice enough. Use good blades - Pegas or Olson. And Never store the saw tensioned. 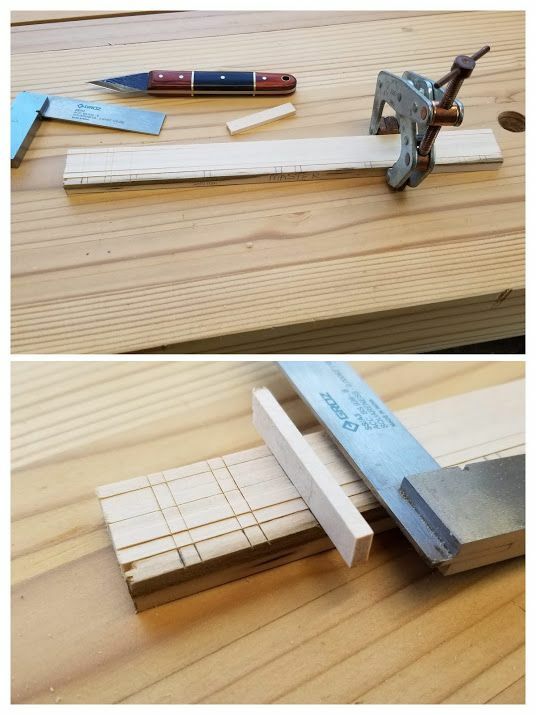 Unscrew the handle to relieve all the tension after you are done sawing. Now to clean up the baselines. 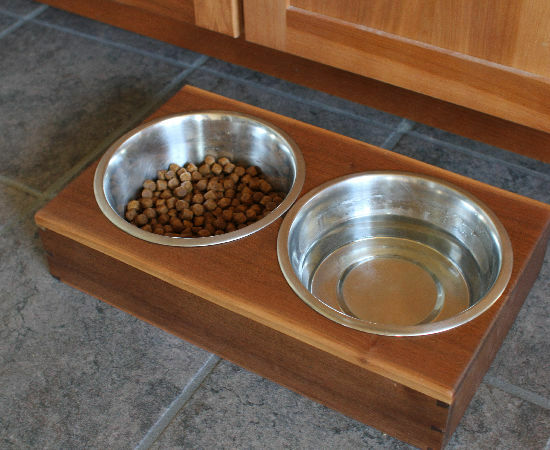 I do this using a bench hook. Before chiseling, I deepen the scribe lines on just the waste using a knife. Pro tip - A sturdy bench helps a lot with chiseling. If you don't have one, position your work right over a leg. This will eliminate any bouncing or spring and transfer all your energy where you want it. Also I prefer a heavy metal hammer to strike chisels. The less force I have to put into my swing the more accurate I can be. All cleaned up. What's the paint bush for? To wipe away chips. Any chips trapped under the piece will make a dent in the final work. Now to transfer the layout. 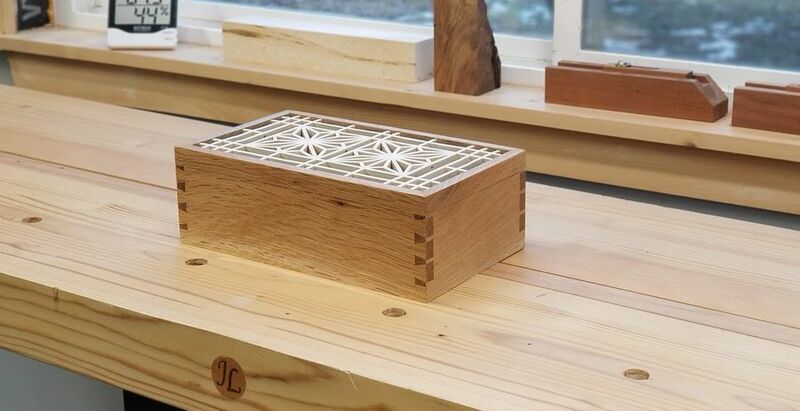 I'm going to use a dovetail alignment board, which is really just half a box with a fence on one side. 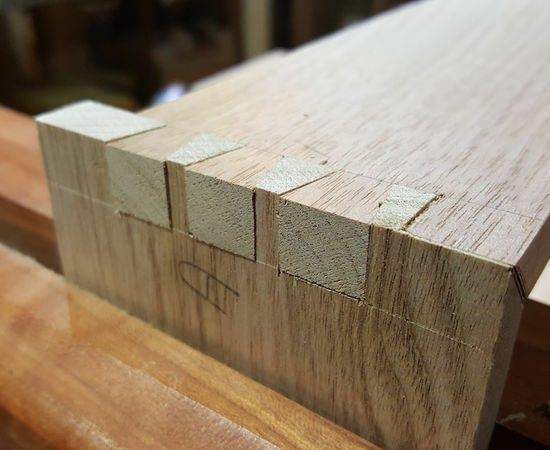 These are great dovetail practice. 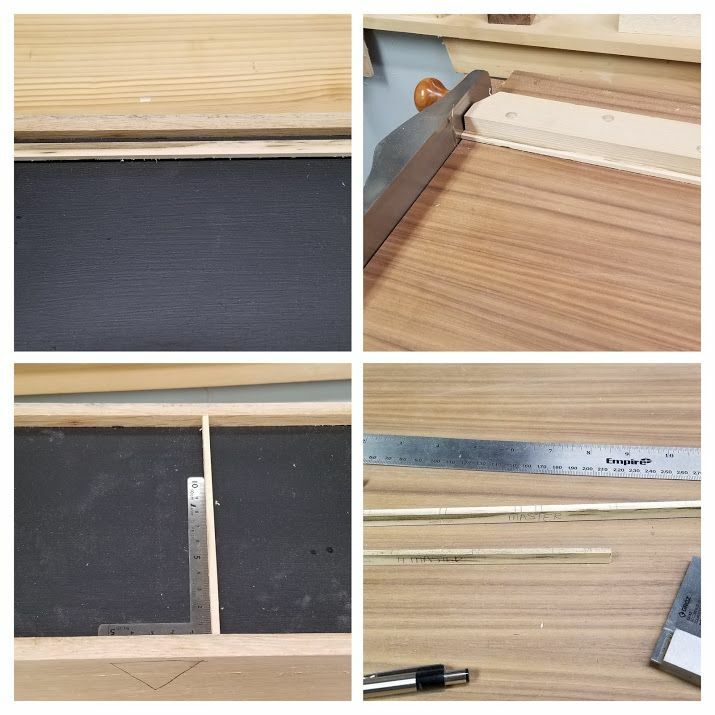 I register the edges against the fence and then line up the baseline on the board I cut with the edge or the corresponding pin board. Notice I have a slight overhang. That's okay and intentional. It leaves me some room to clean up the joint after assembly. It's critical that the BASELINE be used as your reference. remove the waste. The pin board is a bit different than the tails. One face will be narrower than the other. 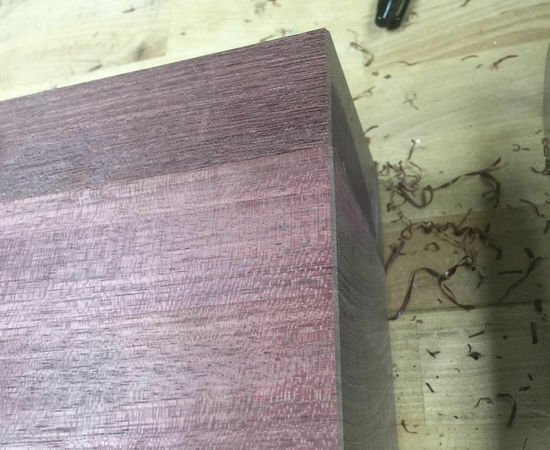 Keep that in mind when selecting the right chisel to use. I like to start from the narrow side. I then clean it up with a chisel and a guide block. The guide block is cut at 45 degrees. I align the edge to my baseline. I'll dry assemble 3 sides so I can measure for the plywood top and bottom. I use the inside dimension + 1/2" ( the grooves are each 1/4" deep). I marked the location for where I need to cut the lid off. There is a good chance I will plane this mark off when I true up the box. So before I do that. I set my marking gauge to that dimension. I primarily work in imperial, but for kumiko it's much easier to put my metric hat on. The gap in the top of my lid is 10mm. I'm resawing these boards to a little over 10mm so I can plane off the bandsaw marks. It's also critical to me that the last tool that touches the basswood is a hand plane. 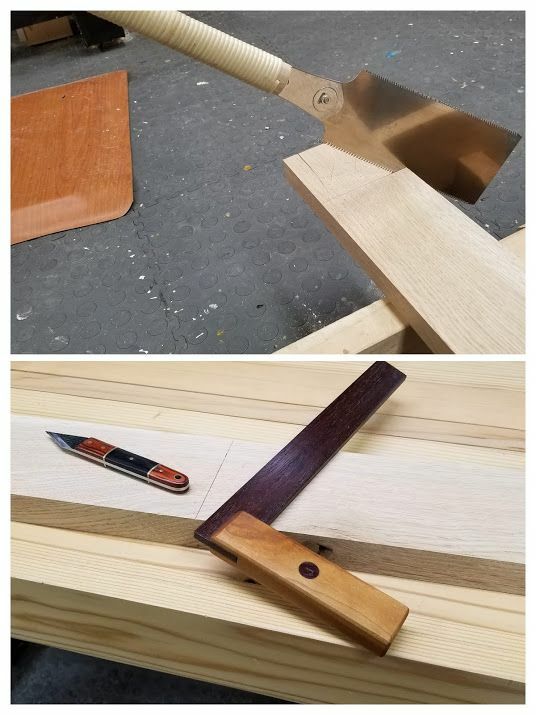 I will not be applying any finish to the kumiko, and a hand plane leaves a very smooth and shiny surface sanding cannot duplicate. Now to transfer the story stick to the kumiko. I'm doing the horizontal here. I add in one extra in case something splits during assembly. Next I gang cut them in a jig. I remove the master kumiko first. 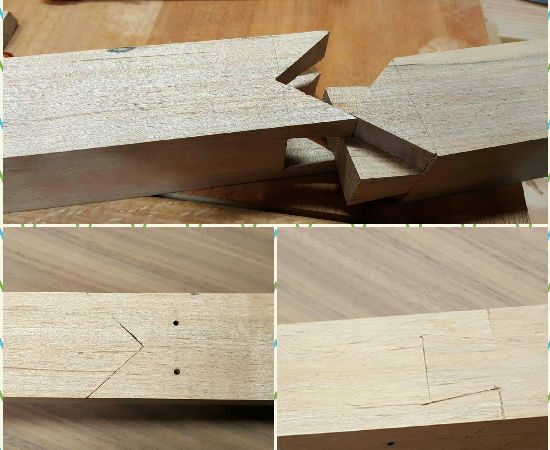 The jig is just 2 pieces of maple that are roughly half the thickness of my kumiko (5mm) screwed to a scrap board. I gang the pieces up and saw them all at once staying inside the lines. I like to use a saw with an extremely fine kerf kere. Now on to the vertical kumiko. Notice the screw removed so I don't saw into it. This is the same process. Now to assemble the grid (or jigumi if you want to get neckbeardy about it). 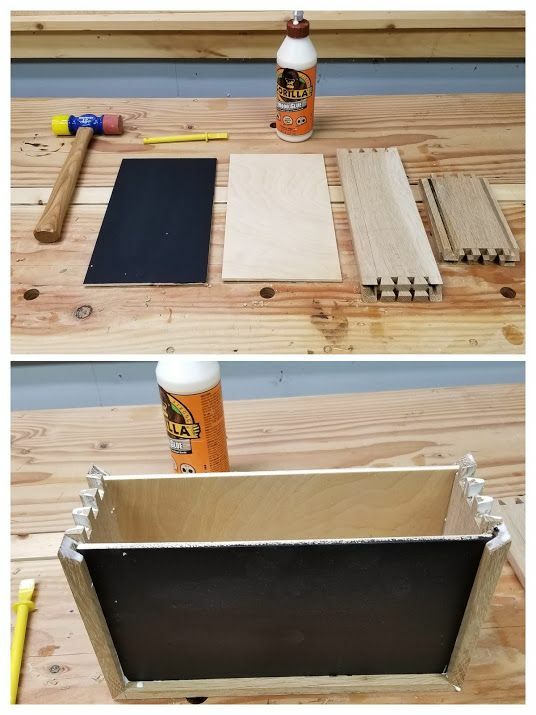 I don't normally use glue, but this is a box lid that will be in a lot of different states of orientation so I use a little. Elmers glue-all or school glue is perfect here. It dries clear. 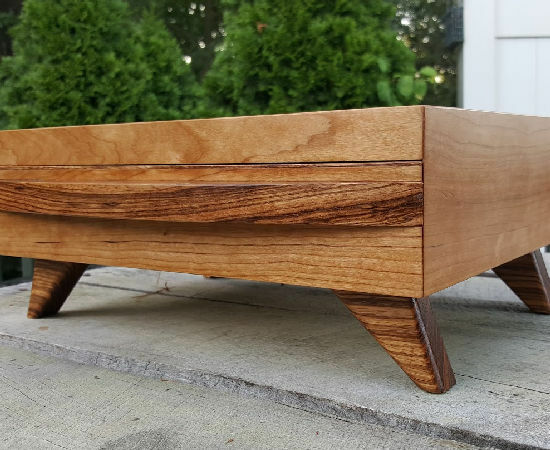 I need to saw off the lid using the mark from before as a reference. Watch your fingers here. I am going to line the inside of the box with this curly maple. This will also hold the lid on. I rip these to the width of the inside of the box + the reveal inside of the lid. 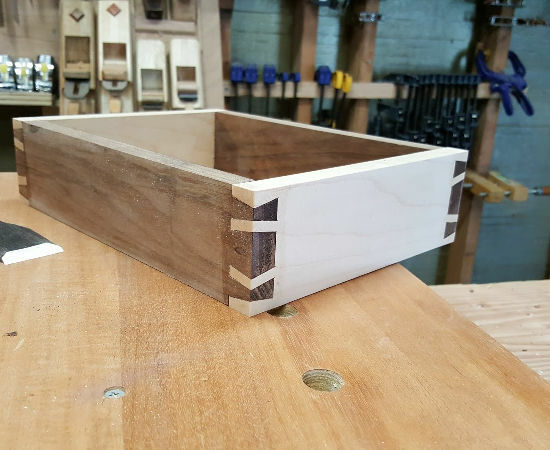 I thicknessed these to about 3/16"
That is a gorgeous box, Joe! Thanks for the write-up.